We all do campaigns from time to time, some might be successful and some might feel like waste of resources. Question is, how to get most out of every campaign we run? To answer this question, we need to study our current customer base. What make them use our service/product? More importantly, what problem are we solving? It must be main focus, if you have no idea what your customers are looking for, then stop right now and use services like SurveyMonkey to ask this question from your customers. Make them engage with your survey by offering something of value once they fill up the survey form. Once you know your customer base, now it’s time to analyze your campaign source. Is your campaign targeting your existing customers? Then you already know what they are looking for. Go ahead and get most of your result by offering them a new feature, discount or something they all are looking for. Are you targeting new customers? Then you must go back and see what problem are you solving for your current loyal customers. New customers will most likely have those problems and you’ll be able to help them. Put focus on what you can solve for them. Make it look big result yet easy to achieve. Make them want to try your product and see if it work for them. If you are going to tagger target new customers, where is better than Facebook ads? You might say Google AdWords, but that depends on your competitor. Try your keywords in Google AdWords and see how much is price of your keywords to be appear in homepage. If that’s very expensive, just forget about Google AdWords. Competition is very high and you’ll lose more than you earn. You might try Microsoft ads system as an alternative where there are less competitors and take it as your advantage. But Facebook ensure that your ads will be seen, commented or shared among users, thus you’ll get more exposure. Make sure your target correct audience. Try to guess which interests are more likely to attracts your specified audience. Try to narrow down your audience, so that you get more quality exposure. You don’t want people who like vintage gadgets to see your high end product ads! Try to run few ads and see which text attract more customers. You’ll need a SEO optimized landing page to bring those users in. It must be as attractive as your homepage, and it must have very clear call to action button. Make sure keywords the is main problem for your users which you are solving, are bold and repeated over. These way you get some chance to earn organic free clicks from Google and beat all those competitors who are paying expensive funds for their ads. Lastly, you’ll need to track this incoming and existing visitors. You never can guess why your visitors are not converting unless you track their behavior and see in which step, visitors are dropping. Hitsteps offer real-time web analytics dashboard so that you can watch them as they switch pages, as well as campaign tracking so the you can see how many entered your landing page and went as far as registration page, as far as add to cart page and so on. Just sign up for your free account and put tracking code in each of your pages. Now you are fully equipped for a campaign success. Run your ads, monitor your audience and pages where visitors are dropping, optimize those weak area, keep changing your ads until you get best outcome and lastly, don’t forget about interacting with comments people leave in your Facebook ads and posts. It was not long ago when all of us web developers were screaming and pulling out our hairs over Internet Explorer! Those days are gone! According to latest updates, Internet Explorer share on browser usage is falling more and more each month. It’s only Advantage is being built in into Windows computers. New version of Internet Explorer 10, is not a bad browser at all, but it’s name still remind us of those sleepless nights trying to fix that small yet big problem in Internet Explorer. We hope that Microsoft’s new browser, Spartan Browser, can come into market as a brand new and bugless browser. According to Hitsteps Analytics, Google chrome is now leader in Browsers war owning more than half of the market. Firefox, Safari and Internet Explorer have an equal usage rate which is slightly less than Google Chrome. Google Chrome being fast and updated regularly with latest HTML5 and CSS3 technologies, make it popular among users and developers. We hope Spartan browser don’t fall short in this war. It is very sad to see Opera browser still couldn’t gain any popularity. Recently, Opera ditched it’s own Presto engine in favor of Webkit (used by Google Chrome and Safari) to be able concentrate more on GUI and other aspects of browsers, however, this decision didn’t improve any of it’s ranks in browsers war. Hitsteps analytics monitor type of devices such as Desktop, Tablet and Mobile phone, therefor we can give following statistics about users device. 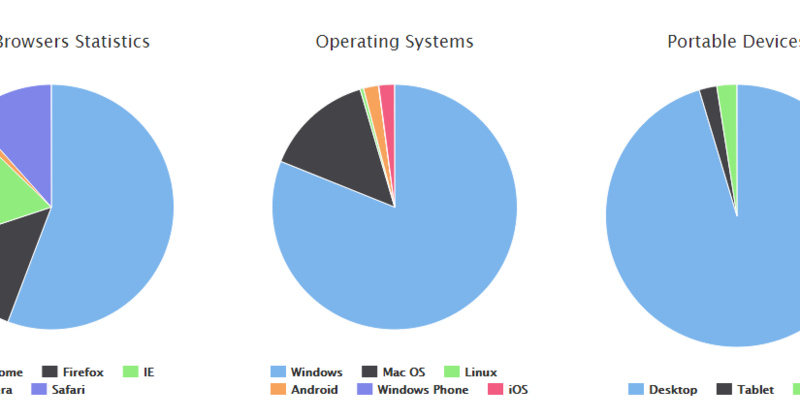 as you can see, Desktop have biggest rate among our users. Will Google Chrome stay leader in browsers war? It’s likely to stay leader and we hope so. Here is a fact. If you install 10 different web analytics in your website, you are going to get 10 different numbers! If you have used log based analytics such as AWstats, they give you information about every single hits even on each images and background images and it cause numbers to go crazy high but then it is not accurate when we consider proxies and cache servers. Once a page is cached, it will be served via cache and it won’t hit the server and therefor, AWstats and similiar log based analytics, won’t know about it and data is missing from reports. Then, we come to position of the codes. We believe analytics shouldn’t reduce speed of your website, so we only load code after webpage is fully opened. It will cause those who close website before it load not to be tracked. some other analytics might track those users in expense of slower website load time. And lastly, we do filter your visitors. We have an active anti-spammer and ani-bot filter to make sure your calculated hits are real humans who actually come to your website. We do block all those automated bots who follow a list of victim website to go inside, scan for emails, fill up form with spam emails and such. That is why sometimes you see differences in your hitsteps dashboard and other analytics. Hitsteps Ultimate Analytics offers accurate, botless analytics reports which numbers differ from basic analytics services. Big news, We are excited to announce Hitsteps is available for free now! Your account is eligible to use free license if your website don’t have much of page views. 1,000 page views per month allowance is good for blogger, photographers and newly developed websites.